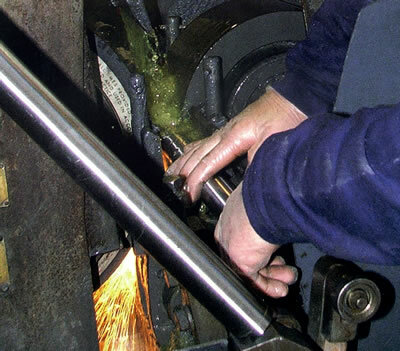 The process of fork regrinding is essential to achieve a consistent surface contour across the stanchion. Generally speaking, the whole stanchion is ground back to the level of the deepest area of corrosion and pitting. There is a limit to how far forks can be ground back and if corrosion is too deep then the forks are beyond repair. However, in some instances localised regrinding and plating can be undertaken to build up a localised area on the forks which saves time on grinding the forks completely and then building them back up. 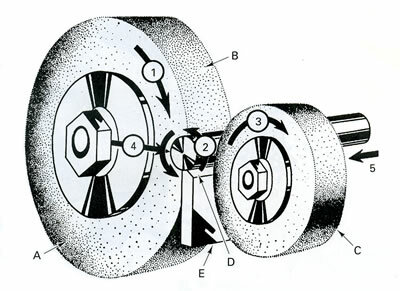 Centreless Grinding: The principle of centreless grinding can be seen in the diagram below. Two wheels are used, the larger one operating at regular grinding speeds which does the actual grinding, and a smaller regulating wheel. The regulator wheel revolves at a much slower surface speed - usually around 50-200 ft/min, and controls the rotation and longitudinal motion of the work-piece. The work-piece is held against the work-rest blade by the cutting forces exerted by the grinding wheel and rotates at approximately the same surface speed as that of the regulating wheel. Cutting: The cutting process is essentially quite simple. The fork is passed through the centreless grinding were approximately 25-50µm is removed. The wheels are reset and the forks passed through again to remove another 25-50µm. This process is repeated until the forks have been ground down to the deepest level of pitting and corrosion. Cylindrical Grinding: Not all forks can be centreless ground and require us to use a cylindrical grinding process. 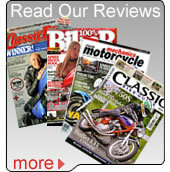 Examples include early British bikes that have steps or different diameters along the lengths of the forks.